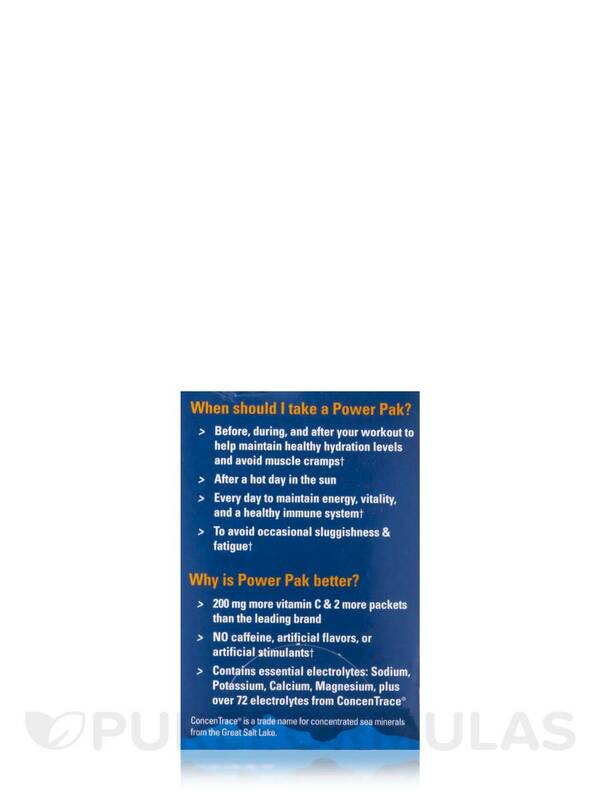 I drink a packet of Electrolyte Stamina Power Pak by Trace Minerals Research every morning on an empty stomach before my 5-6 mile run. Keeps me fresh and hydrated every time! 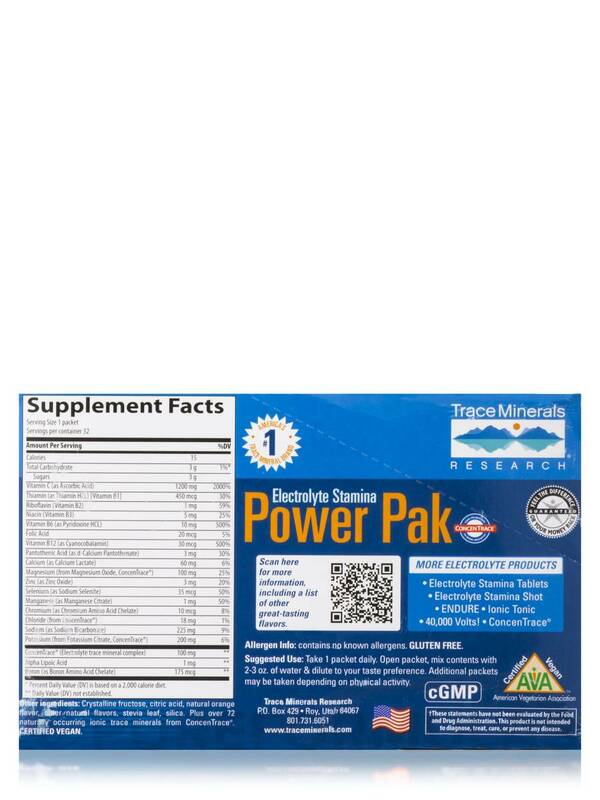 Electrolyte Stamina Power Pak by Trace Minerals Research is a good tasting product and instant electrolyte replenisher! 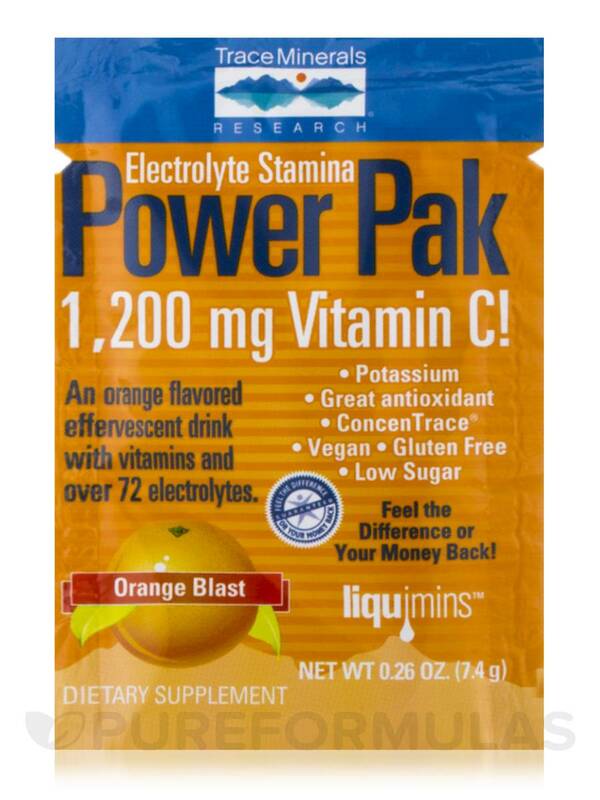 Electrolyte Stamina Power Pak 1200 mg of Vitamin C! 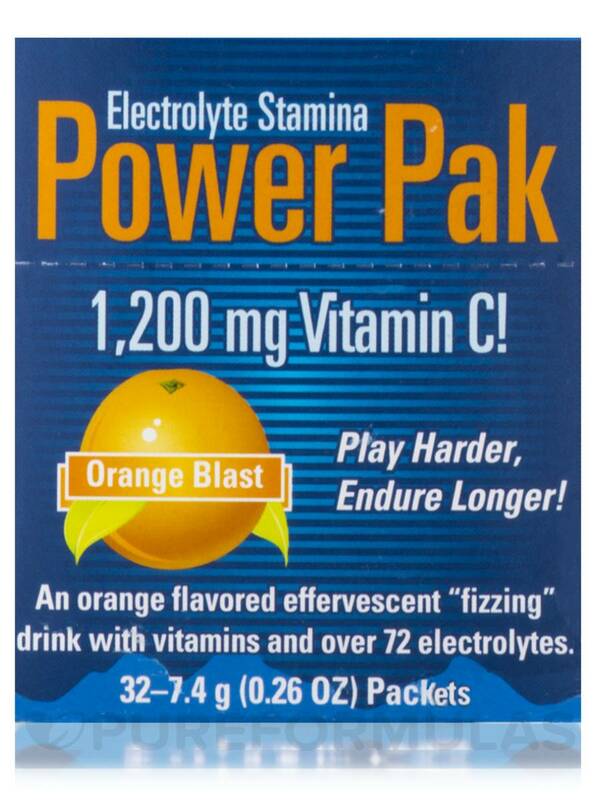 A Orange Blast flavored effervescent "fizzing" drink with vitamins and over 72 electrolytes. - Gluten Free. Low sugar. 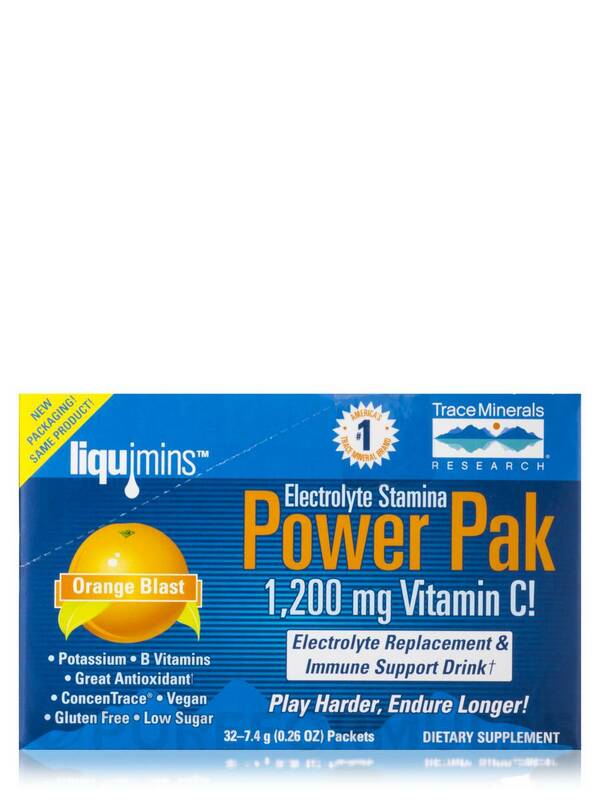 - Electrolyte Replacement & Immune Support Drink. If you have ever felt drained or sluggish after a day in the hot sun or a tough workout‚ your body may be telling you that it needs more electrolytes. Electrolytes are needed to maintain proper fluid balance and to optimize your energy levels‚ so you can function at your best. 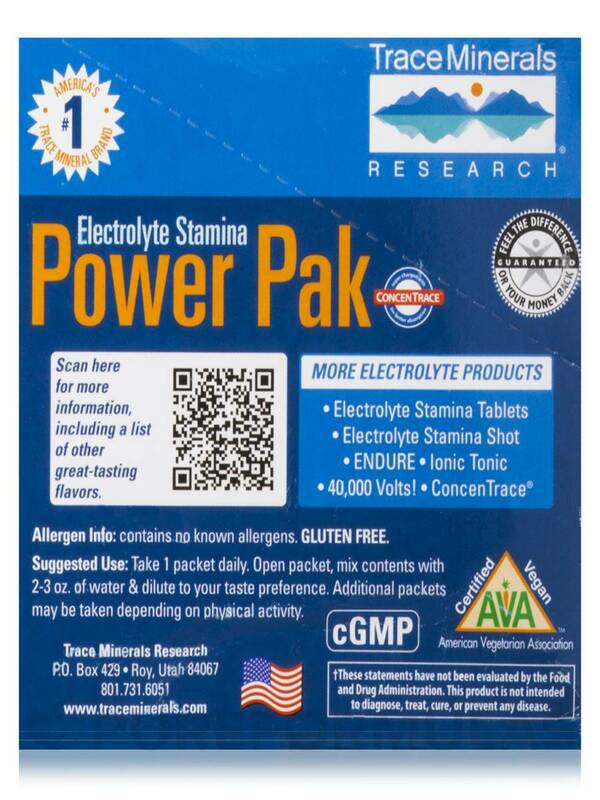 Electrolyte Stamina Power Pak is an easy-to-fix high performance energy drink with no caffeine‚ artificial flavors‚ or artificial stimulants. 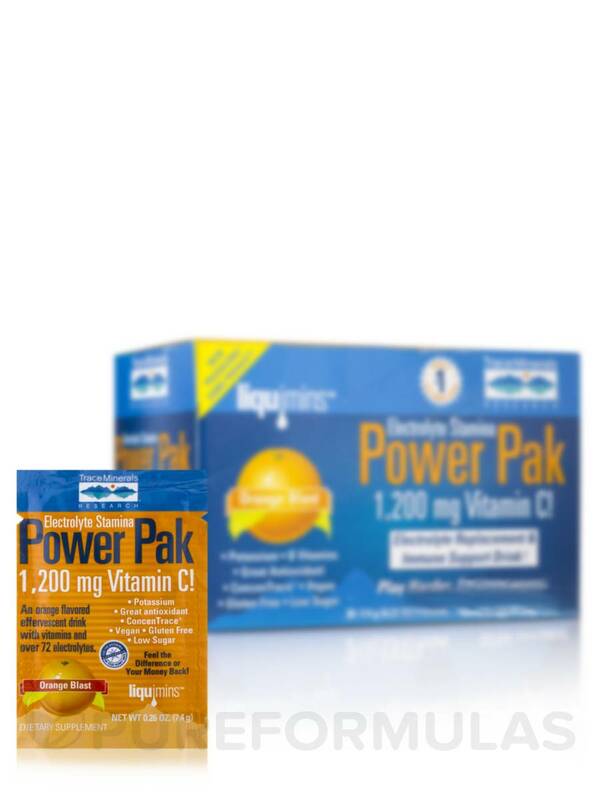 Their formula contains 1200 mg of Vitamin C‚ an essential antioxidant for people who are active and on the go. It also contains all major electrolytes (potassium‚ magnesium‚ chloride and sodium)‚ plus over 72 verified ionic minerals and trace minerals from ConcenTrace®‚ which accelerates assimilation and absorption of vitamins and nutrients. These electrolytes conduct electrical impulses in the body and also help maintain your body’s acid base balance for more energy and vitality. A deficiency of any one of these electrolytes—or even an imbalance—can cause a wide range of problems‚ including sluggishness‚ fatigue‚ decreased energy and muscle cramping. So play harder‚ endure longer and feel replenished with Electrolyte Stamina Power Pak—the right way to revitalize and recharge your body’s natural energy source. - Before‚ during‚ and after your workout to help maintain healthy hydration levels and avoid muscle cramps. - After a hot day in the sun. - Every day to maintain energy‚ vitality‚ an a healthy immune system. - To avoid occasional sluggishness & fatigue. 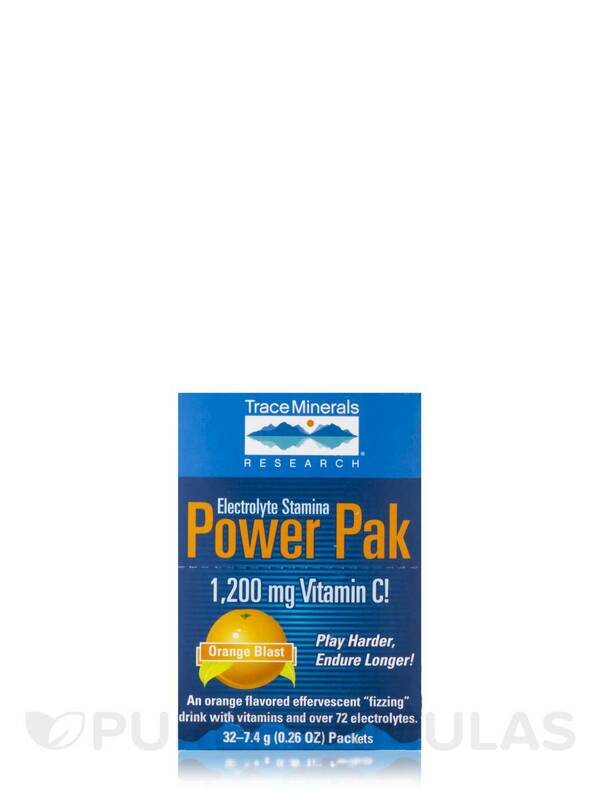 - 200 mg more vitamin C & 2 more packets than the leading brand. - No caffeine artificial flavors‚ or artificial stimulants. 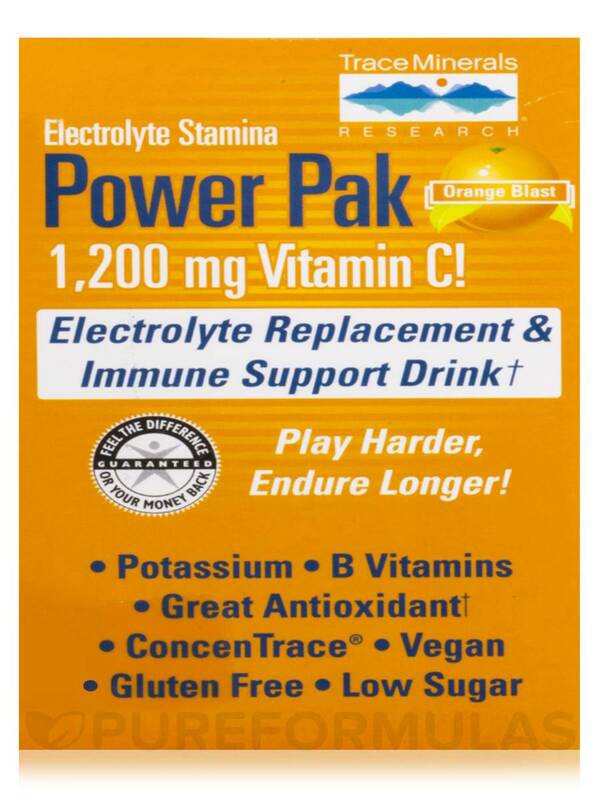 - Contains essential electrolytes: Sodium‚ Potassium‚ Calcium‚ Magnesium‚ plus over 72 electrolytes from ConcenTrace®. ConcenTrace® is a trade name for concentrated sea minerals from Great Salt Lake. 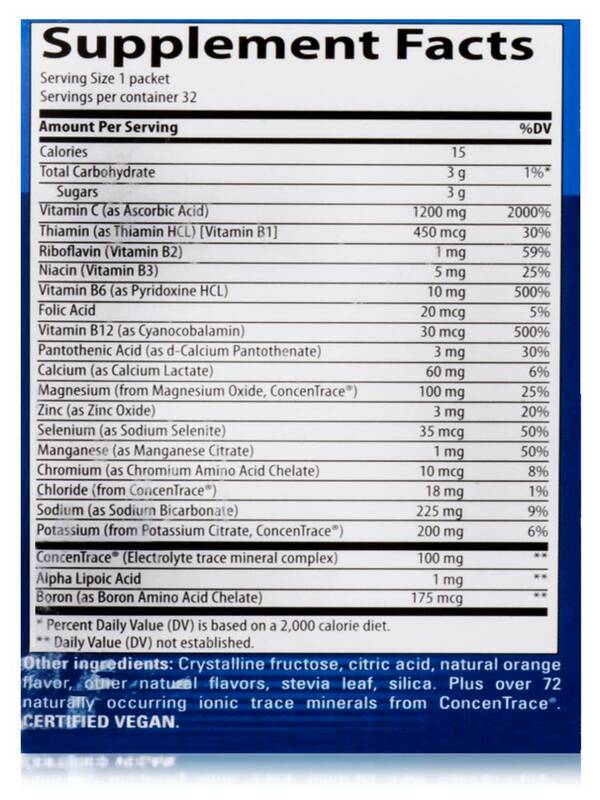 Ingredients: Crystalline fructose‚ citric acid‚ natural orange flavor‚ other natural flavors‚ stevia leaf‚ silica. Plus over 72 naturally occurring ionic trace minerals from ConcenTrace®. 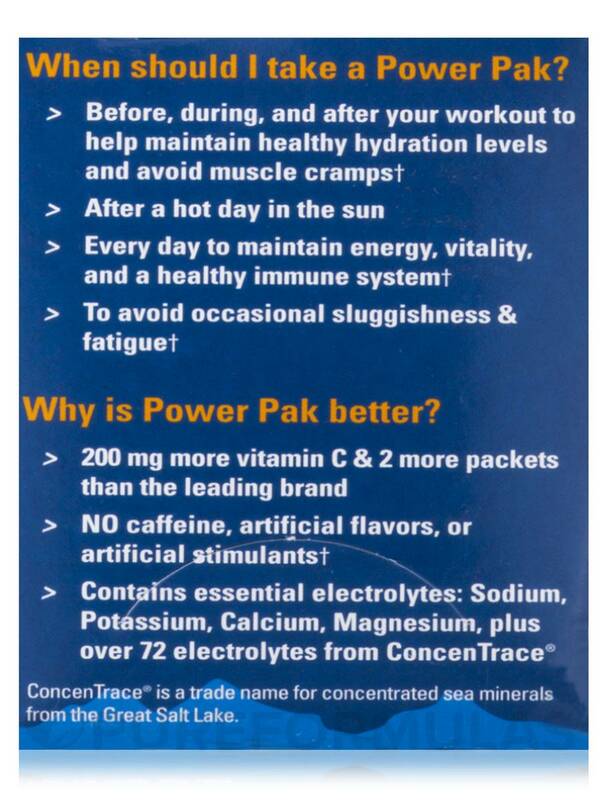 No Caffeine‚ artificial flavors‚ or artificial stimulants. Take 1 packet daily. Open packet‚ mix contents with 2-3 oz. of water and dilute to your taste preference. Additional packets may be taken depending on physical activity. Some caking may occur. This does not affect the quality or integrity of the product. Great Taste. Dissolves well. 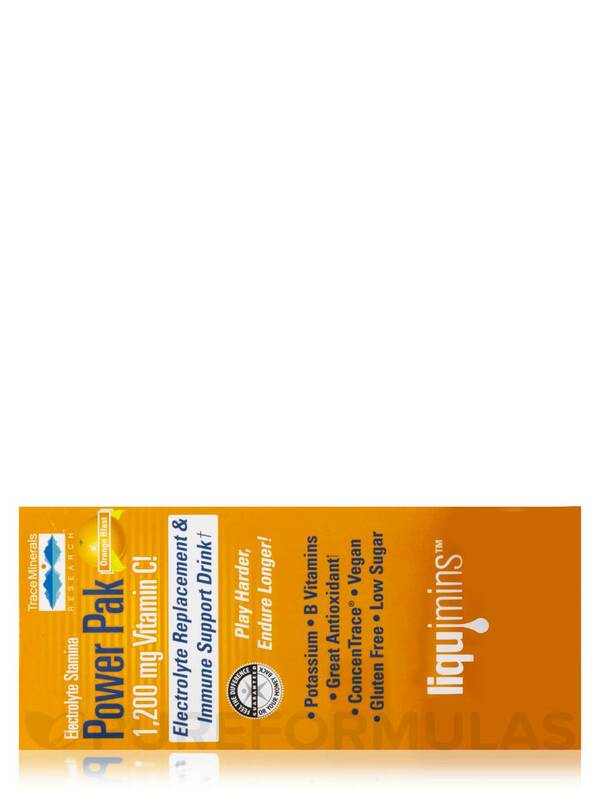 Replaces electrolytes. A bit expensive and has more carbs than I thought it had.